This is an abridged and slightly edited version of the article originally published on videogameperfection.com here. All updates to this article will now be done here. On this page we will be covering all the basics of setting up a game in DOSBox, including installing the game, running the game and configuring controllers. Initially we will create a single configuration suitable for running SVGA DOS games. Alternative configurations may be added in the future too. There are lots of types of games DOSBox can run and the best configuration for really old, 1980’s PC games isn’t always the best for games from the 1990’s for instance. DOSBox users can get access to technology such as pixel shaders and scalers similar to those mentioned in our article on VideogamePerfection.com here. However, by the early 1990’s PC games were already outputting to 640×480 screens, a resolution that most modern TVs and monitors can up-scale quite nicely. If you prefer to watch rather than read, check out this handy video tutorial. The video goes from having just installed DOSBox right up to getting a game running perfectly. Follow these steps if the article you are reading instructs you to use a standard DOSBox SVGA configuration. Step 1 – Download and Install DOSBox – If you haven’t installed DOSBox before, download it from this website. The file is downloaded as an executable installer, so simply run the installer after the download and follow the on-screen prompts. 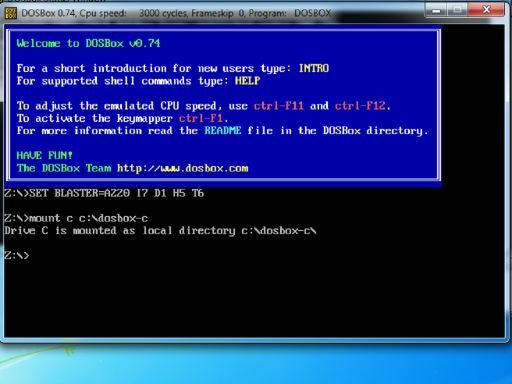 Step 2 – Create a DOSBox folder – After you have installed DOSBox, you need to create a folder on your computer to store your games if you have not done so already. You can put this folder anywhere; in the video I used C:\DOSBox-c. You will need to note the path to the directory, if you don’t understand the concept of file paths, there’s a good tutorial here. Step 3 – Start DOSBox and mount directories – Before you fire up DOSBox for the first time, you will want to insert your PC game CD into your CD/DVD drive and make a note of the drive letter. Now, you can start DOSBox. Before you can install the game, you will need to execute a couple of commands. You interact with DOS PCs, and therefore DOSBox too, by typing commands and then pressing enter, rather than by clicking icons. The picture below shows a DOSBox session with the C drive mounted as a virtual hard drive. By entering the command “mount c c:\dosbox-c”, we tell DOSBox to use the folder “dosbox-c” on the C drive as a virtual hard drive. To mount another folder, simply swap the “c:\dosbox-c” with the correct path to the folder you want to use. Now, by entering the command “C:” we can change to this virtual drive and start working with it as if it were a real hard drive attached to our DOSBox PC. Mounting a CD-ROM is done in a similar way, but we need to tell DOSBox that the mount is a CD so that it can be handled accordingly. The command to use is “mount d f:\ -t cdrom -usecd 0 -ioctl”. Substitute ‘f’ for the drive letter of your CD or DVD drive. Step 4 – Learn the basic commands – With your virtual hard drive and your CD-ROM mounted in DOSBox, there are a few handy commands you might want to learn in order to get around the emulator more efficiently. DOS is not a case sensitive operating system, meaning you can type the commands here in capital or small letters and it will make no difference. dir – displays a directory listing of the current directory. Directories are exactly the same concept as folders are in Windows. cd – change directory. For instance to change into a directory (<DIR>) called “foo” you would type “cd foo”. If you want to go back up to the previous directory, type “cd ..”. Running a program or batch (BAT) file – To run a program, simply type the name of the program and press enter. You can run anything labelled EXE, COM or BAT. Step 5 – Installing your game – Make sure you have mounted your games CD-ROM as described in step 3 above. Now, type “d:” and press enter to change to the ‘d’ drive (which is now your game CD). Type the “dir” command to get a list of files on the CD. Usually there will be one called “INSTALL EXE” or “INSTALL BAT” or something obvious. Type “install” or the name of the file to run and installation should then start. Once it has completed, you can change back to your C drive (by typing c:) and then do a “dir” command again. You should see a new directory for your game. Now it’s just a matter of issuing a “cd dirname” command (where’ dirname’ is the new folder name). You can then do a “dir” command again and find the EXE, COM or BAT file that should start the game. If we have produced a specific guide for a particular game, this step will be covered in more detail in the game guide. Step 6 – Automation – Having installed your first game, you might want to automate the mounting process we described in step 3 so that you don’t have to type long-winded commands each time. To do this, you need to edit the DOSBox settings file. Open the Start Menu or Start screen and search for “DOSBox options” and click on the icon. A configuration file should open in Notepad. Scroll right down to the bottom of the text file, to where it says “# Lines in this section will be run at startup. # You can put your MOUNT lines here.” Below this comment, add the mount commands as discussed in part 3, one per line. In our example that was “mount c c:\dosbox-c” and “mount d f:\ -t cdrom -usecd 0 -ioctl” (without the quotation marks of course). In the picture, the user has mounted their virtual C drive to G:\ROMS\DOS and their CD-ROM’s letter is ‘h’. Step 7 – Configuring controllers – After completing step 6, you should be able to start DOSBox and go instantly to your C drive and run your game. If you want to use keyboard controls only, then you are all set. For the rest of us, it’s time to test and remap some controllers. To test joystick controls in DOSBox, there’s a handy utility called JOYTEST. You can download this program from this link. Place it in your DOSBox virtual C folder and you can then run it through DOSBox. 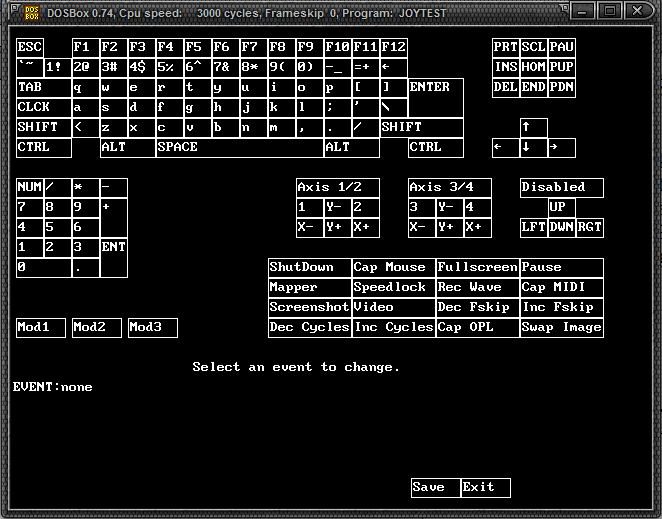 This utility will then give you an overview of how your controls are mapped inside DOSBox. The picture below shows the program running. To use this screen, click on a control and then click “Add” to add a new mapping or “Del” to remove the current mapping. In the video tutorial the Xbox 360 controller is remapped so that up and down are configured to the left and right analogue triggers. This mapping is ideal for driving games. On an old fashioned joystick, the player would push up to accelerate and pull back to brake. By reconfiguring the controls so that the analogue triggers are up and down, we effectively give this old game a more modern, comfortable control system. Pay attention to the positive and negative axis. If you map a positive axis on your controller to a negative axis in DOSBox, you will likely confuse the game and you won’t be able to complete controller calibration. Don’t forget to click Save when you are done remapping controls. Changes you make here will persist across DOSBox sessions. You can now test your new mappings in Joytest and then start your game. Most DOS games require controllers to be calibrated before they can be used. To do this, select the appropriate option from the games menu. If you configured the controllers correctly you should be able to quickly calibrate them in the game and then start playing. If you need to remap keyboard controls to your joypad while using DOSBox, we recommend using Xpadder. Although you can do this using the mapping screen in DOSBox, Xpadder is far more user friendly and pretty much anyone who is serious about PC gaming should own a copy anyway. We discuss Xpadder in more detail on this page on VideogamePerfection.com, but using it is easy. Simply setup the controls for the game you are playing and then play.